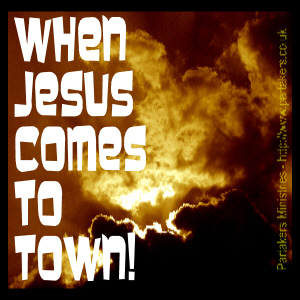 google-site-verification: google3e8cc4742c5fd8a2.html Jesus Comes To Town! Revelation 21v4 - "God will wipe away our tears. There will be no more death, nor sorrow, nor crying and no more pain, for former things have passed away." The audio MP3 file for this sermon can be downloaded by right mouse clicking here. Today I want to do two things on our subject of heaven as given to us in Revelation 21. Firstly I want to give a big picture view of this chapter, which gives just a snapshot of heaven - the place where God radiates His glory and Jesus is the city light, the streets are made of purest gold and where we shall serve and honour Jesus in all His glory. Then secondly, I have picked out just 3 brief vignettes for this morning, as we contemplate together our eternal home. The book of Revelation is the book where the bride of Jesus are consummated in marriage to Him. It is where, we the church, the bride of Christ are finally joined with Jesus as One. In Revelation, God's programme of redemption, starting all the way back in Genesis, comes to fruition and God's holy and majestic name is vindicated before all creation. Here Jesus is seen in all His glory, to judge the earth and to rule it with righteousness. The writer is the Apostle John, now approaching 100 years of age and almost blind. John was in exile on Patmos, put there by the Romans due to his effective witness for Christ. Patmos was where the Romans banished criminals and political offenders. There was open persecution of Christians at the time. This is the same John, who was the apostle Jesus loved. John saw Jesus walk on the water. He seen and heard Jesus command a storm to cease! He saw Jesus both weeping. He saw Jesus in righteous anger clearing the Temple courts. He seen Jesus heal the sick and raise the dead. He himself had been there with Jesus when Jesus had cast out demons. He had been there when Jesus miraculously fed the 5000 with 2 loaves and 5 fish. He had his feet washed by Jesus. He saw Jesus transfigured. He saw Jesus torn and bloody on the cross as Jesus died. Three days later he ran to survey the empty tomb. He saw Christ risen again and ascend into heaven. And in verse 14, John reads his name written on the foundations of heaven. As John was taken up in the Spirit (v.10) to view this majestic image, I wonder if John looked back and remembered the sufferings he had endured for the sake of Christ. His torment at the hands of his persecutors for the sake of Christ. I wonder if he thought to himself, "it was all worth it and no matter what I endured for the sake of the gospel and for the glory of my Lord and Master." What is the purpose of heaven - for the eternal worship and glorification of God. We shall serve Him (22:3). Its inhabitants are saved (v3); satisfied (v6); and overcomers (v7). (v.6-7) God's people possess it!! They are thirsty for Jesus, and drinking from the fountain of the water of life. God's people have overcome! Overcoming doubts, trials and persecution because of their reliance upon Jesus. God's people inherit it. God will be their God and they will be His people. An echo back to the time when God called the nation of Israel to Himself. It is composed of people from all nations (v.24),p echoing again that promise God made to Abraham all those years ago about Abraham being a blessing to ALL nations. It is a secure and promised place (v.5-6) God has said it, it will be done!! Also nobody can enter if they don't trust and obey Jesus. If somebody's name isn't written in the Lamb's Book of Life, they wont be entering (v.27). Will your name be in there? You may have noticed the frequent use of the number 12 by John. 12 is the symbol of the church - both in the Old Covenant and the New Covenant, hence its unifying, continuing significance here. The number 12 is God's choice to show completeness and perfection. This can be seen in the 12 gates mentioned in our passage - 12 gates is enough for all!! And for us, this leads and gives us confidence in a God who longs for all to live with Him eternally. (v.12) 12 gates and 12 angels with the 12 tribes of Israel written on them. (v.16) A perfect cube - 12000 furlongs high, wide and deep. That is about the same distance as Edinburgh to Rome. It is symbolic of the Holy of Holies in the Jerusalem temple, where the priest could only enter once a year. This whole city is a temple, where we encounter God face to face, not just one day a year, but all the time! (v.17) each wall is 144 cubits. Twelve square is 144. (v.19-20) 12 stones symbolises the 12 stones around the high priests breastplate to signify the 12 tribes of Israel. (v.22-24) God's glory radiates through the city!! His glory, radiating in purity, to make it a sacred place so that God is accessible to all. Jesus The Lamb is the light of the city. There is no sun or moon. One of the most beautiful buildings in the world is the Taj Mahal in Agra, India. It was built by a Muslim emperor in memory of his wife, of whom he had only known 19 years. It took 20,000 workers a day and 21 years to complete. In Britain today, it would cost about 2,200,000,000 pounds and made of the purest marble sitting on a red sandstone base and adorned with precious jewels. Now if a pagan Indian prince can make this beautiful building for somebody he had known for only 19 years, how much more beautiful than that, is our new home going to be. Jesus has been working on it almost 2000 years to this point in time!! Heaven is a beautiful place, prepared for you and me, to live forever and ever! At the moment, I live in Christchurch and my wife temporary lives in our London flat. But when I get home to London, I know I am expected and loved. She has my favourite meal prepared. The heater on. Everything I like, that makes it a home is done for me, by her! The first week I was showered with balloons and all manner of things, because I was expected and she loves me!! When we got married ten years ago, we had a wedding here in England and 3 days later she flew to her home country to prepare for our wedding there, which was to be 6 weeks later. I had no idea what was going to happen when I flew there for the wedding. But, when I landed there, every detail was prepared and ready. Similarly, when we go home, Jesus has prepared a place for those of us who love Him, trust Him and obey Him. Jesus is waiting for us! He is expecting us, wanting to lavish His love upon us. We know He loves us now, but that is only in part. When we are with Him eternally, we shall have the full picture of Jesus. He is with us now in Spirit, but then we shall be with Him physically. Heaven is a prepared place of extraordinary beauty. John tries to portray it for us, building up layer upon layer of words, just as painters paint a picture. Laying on the colour, as they paint until finally the painting is finished. We all suffer in some way. For myself in the recent past, I have suffered with a brain haemorrhage. I went to bed on a Saturday evening and woke up in intensive care on a Tuesday afternoon. I have lost three days, I will never regain. I continue to take medication for blood pressure and hypothyroidism in the morning and in the evening I take anti-convulsants. With the medication, come all manner of side effects. I find it difficult doing certain activities. In childhood, I had to overcome the suffering of childhood asthma that almost took my life several times. Sometimes my entire body aches and groans in protest at my actions. We suffer, don't we. My father suffered for years under a misdiagnosis when the doctors originally thought he had emphysema, before they found out too late that it was actually a hiatus hernia, where the stomach acid comes back up and enters the lungs and burns them internally. My mother suffers with arthritis and hyperthyroidism. We suffer don't we? One day soon, we will have perfect bodies and full health. We only have to look at the news on TV or read the papers to see global suffering. There will be no more terrorism, missiles, guns, wars or bombs. No more will man's inhumanity to man be allowed. No more torture, rapes, muggings or robberies. No more poverty or famine. No more religion, idols or icons. No more gossip, fornication, adultery, lying or debauchery. No more cowardice. No more pain. No more death. No more suffering. No more sin. Suffering of any kind leaves some sort of scar or mark. Do you have scars? Physical, emotional or mental scars due to sickness, somebody else sinning against you or as a result of your own sins? Scars come as a result of human life. Much like a house that has been lived in. Scratches in the paintwork. Dents and knocks in the wood. Our human bodies are the same, yet... Yet, one day they will be gone!! Vanished!! A pure body you will have!! And I will have! No need for annoying spectacles. There will be no Specsavers or Stannah stair-lifts in heaven!! No more wheelchairs. No more walking sticks or frames. No more hearing-aids. No more braces. No more doctors or dentists!! Perfection attained and it is to the glory of God and His majestic doing, that this will occur. Do you believe it? Do you live it? Are you suffering today from sickness? Are you suffering today because of somebody else?? Well one day, one glorious day, all suffering will be banished for those of us who love Him. Read with me verse 4, "God will wipe away our tears. There will be no more death, nor sorrow, nor crying and no more pain, for former things have passed away." Take that verse to heart. What a glorious day it will be for those of us who love Him now. God Himself, wiping away our tears... It will be a place where we will live the fruit of the spirit for eternity. A place where "love, joy, peace, longsuffering, kindness, goodness, faithfulness, gentleness and self-control are permanent and universal." (Gal.5:22-23). What a day, that will be!! We will enter those gates, thanking Jesus, looking back at how we suffered. Not only medically, but also for His sake and saying with John "It was worth it all. The sufferings I endured and overcame for the sake of Jesus, was all worth it, so as to be here eternally." Heaven is prepared and pure. Do you know how a pearl is formed? When an oyster gets an irritating grain of sand within its shell, it covers it over with layers of mother-of-pearl until the irritation and the suffering is no longer felt. Now what could the suffering have been with these giant pearls that are the gates (v21)? I think they are to remind us of the cross and the suffering and pain that Jesus endured. People denigrate the cross. I have had people say that "the cross doesn't matter and your religion is as good as my religion thank you very much. Because all religions lead to heaven, don't they?". However the very gates of heaven tells us that is wrong. It tells us that it is only through the cross, that we get to pass through the gates to enjoy heaven in worship and service of God. Only through the pain, the agony and the suffering that Jesus endured, culminating in His crying "My God! My God! Why have You forsaken me?" God Himself has suffered for us, so that we may enjoy His company forever and ever, if we only trust and obey Him now and placed our faith in Him while we are here. We know in part now, but then we will know in full. This makes the sins that we commit while we are here on earth trying to follow Him, even more serious. Sometimes we take a rather blasé attitude to sin. We excuse it as only a little sin and it doesn't really matter. Each time we sin as believers, it is as if we are spitting in the very face of Jesus. Our desire should be, to be Jesus and to be like Him. I long to be perfect. When I make a mistake and sin, I cry out in frustration to be perfect now! However, I also know that God is taking off my rough edges to continue making me purer, more like His Son Jesus, each day under the power and direction of the Holy Spirit. I won't be entering heaven because I am Australian. Although I consider that a very close second. You won't even be able to claim your entry into heaven by showing your passport that shows you are a British citizen, let alone a member of the European community. Even more surprising to some across the Atlantic I am sure, is that if you are American, your passport wont even let you in!! No, we can only enter heaven, our new home, through the cross. When we first decided for Jesus and turned over our lives to him, that is when our eternal life with Him commenced. Be encouraged, heaven is for you if you are trusting and obeying Jesus and have him as Lord of your life! Are you suffering? Suffering will soon be gone. When you sin against God, keep a short account and ask for forgiveness as soon as you recognise that you have sinned and the Holy Spirit has convicted you of it. We long to be with Him for ever and ever. We are to keep one part of our mind on Heaven and the other on the responsible work we have been set to do, here on earth. We are not to be so heavenly minded, that we are of no earthly use. Conversely, we are not to be so earth bound that we are not tied to Jesus in our eternal home. Go tell somebody. Won't you go tell somebody this week, this message. Heaven is a great big place, and there will be room for everybody in this town, this county, this nation and this world to enter through one of those twelve gates! Go and share this good news with somebody this very week. What now can we say? Chapter 22. (v.14, 17) - Trust Him! (v.8-9, 15) Live a life worthy of Him! (v.7, 12, 16, 20) Look for his coming! He is coming back for us soon! I conclude with this quote from CS Lewis' last book of the Narnia Tales - "The Last Battle" : "But the things that began to happen after that were so great and beautiful that I cannot write them. And for us this is the end of all the stories, and we can most truly say that they all lived happily ever after. But for them it was only the beginning of the real story ....which no one on earth has read: which goes on for ever: in which every chapter is better than the one before." The sermon as a audio MP3 file, you can download by right mouse clicking here. If this podcast has blessed you, please do prayerfully consider making a donation.